Since 2005, More Than Mobility Inc. has been supplying prosthetic devices to prosthetists and their clients throughout North America. The company is owned and operated by Steve and Anne Middleton and is based in British Columbia, Western Canada. Steve Middleton is an above knee amputee who started More Than Mobility five years after becoming an amputee in an effort to become more involved with the world of physical rehabilitation and to continue work as a preferred mentor with fellow amputees. During the time spent researching and developing More than Mobility, Steve had the opportunity to trial many knees in the world market including the C-Leg, Bartlett Knee and XT9 Knee. Now with more than ten years experience as an amputee, he has gained an in-depth knowledge of prosthetics, knees, and the functions and adaptations required for many purposes in daily life and in sport. Steve is also a amputee support mentor. 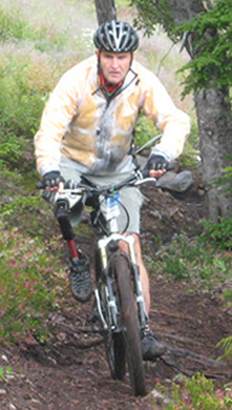 Steve is over 50, remains extremely fit and active, all the while using prosthetics that suit his diversified activities, including road and mountain biking, downhill skiing, swimming, scuba diving and golfing. As an athlete and avid Race Director, he also organizes and participates in multi-day cycle races to fundraise for local charities and rehabilitation centers (links to past and upcoming events can be found here). More than Mobility currently distributes prosthetics knees, ankles and parts, and is the official Canadian distributor for Ortho Europe products. Steve welcomes your questions or comments regarding rehabilitation and prosthetics, and hopes he can help find a way to increase all amputees mobility, especially in helping them rediscover a love for sports.